The Streetlamp Doesn't Cast Her Shadow Anymore: Get your own Scrap Trident blog button! You may have noticed that the Streetlamp now comes decorously fitted out with its very own Scrap Trident hyperlink button (see our sidebar, to the right). Naturally, if you have your own blog, you'll want to show that you too support 2013's most important radical event - a chance over three days in April for the people of Scotland to demonstrate what they really think about the weapons of mass destruction parked on our doorstep. Well, now you can. Below, is a rather nice 125 pixel square badge for your own use. The code you need to display it is provided right alongside. Just copy and paste it into your own HTML editor and Hey Presto! 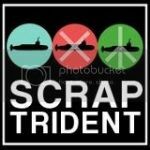 Clicking the button will take you right on to the ScrapTrident home page where your webpage visitors can sign in to show their support or donate to the cause. If you have a webpage, make sure it has its Scrap Trident button in place this Spring. It's what all the best websites are wearing! If you have any bother with the HTML code provided, please get in touch with me at the sadpanda email adress above and I'll see if I can help.